Here's the sleeper bus bound for Kunming from the border town of Mohan. Looks surprisingly pleasant, doesn't it? Or at least new and safe. And here I'd imagined myself sleeping on the disco smoking bad-action-movie bus. The man with the dark-green shirt and the wheelie bag is a Korean tourist. Next to him, the guy with the red-and-black backpack is an Irish architecture student who is interning in a city close to Shanghai. Bonus: He speaks Chinese. The Korean guy and I quickly came to depend on the Irish fellow's Mandarin. And that's not all. The Korean guy had to borrow money when no one would change his Australian dollars, and the Irish guy was happy to oblige. Our bags were tagged and efficiently stored under the coach. We boarded—but were all three stopped at the door to remove our shoes. We were each given plastic shoe bags and sent on board carrying the little sacks, like dog owners at a dog park. The inside of the coach was as new and decent as the outside. 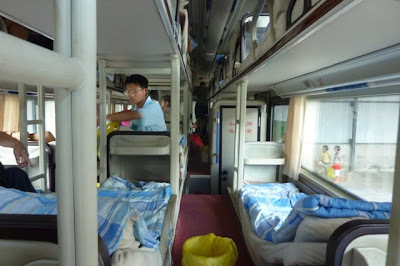 I was surprised to see three rows of bunks—one on each side and a thin row of beds down the middle. 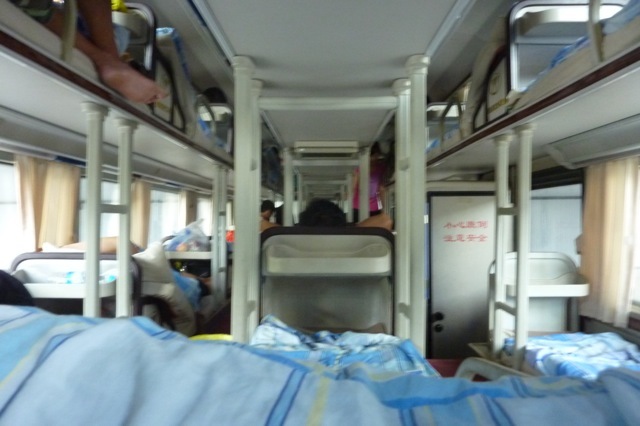 There were upper and lower berths. My assigned bed for the night was the middle one in the back, while the Irish guy had the one just to the left of me. Our Korean friend was up top, just in front of us. "Wow. This is..." I started. "Comfortable." The Irish guy was as surprised as I was. No TV on the coach. No smoking on the coach. No music. No shoes, even. I tucked mine under my bed, which was about six inches off the ground. I put my daypack behind me—being at the back had its advantages. 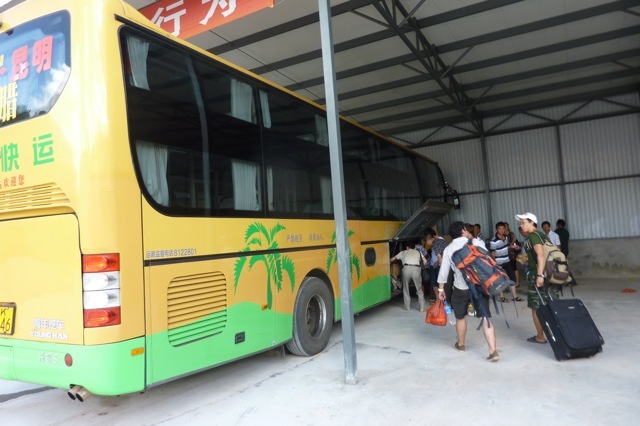 We drove to Jinghong, where the Korean guy desperately tried to change his Aussie dollars. I was surprised by the state of the bus station toilet. Not how bad it was—the opposite. It was fine. China sure has changed a lot in ten years. Chinese toilets in 2001 were appalling. Stinky squats with no doors, usually stuffed up by paper that people carry along. The border town and frontier post had been new and shiny. The bus looked great. Even the toilets weren't the nightmare-inducing frights they once were. Ten years is nothing, normally, but in China's current push to modernize, ten was more like twenty. We re-boarded and headed north towards Kunming. I ate Oreos in bed, ran down all my phone time screwing around on Facebook, and smeared Nutella onto the slices of bread I'd picked up in Mohan. The road forward was smooth and ran through tunnels under mountains. I snuggled in among my Oreo crumbs and fell asleep quickly. The sleeper bus was outstanding.